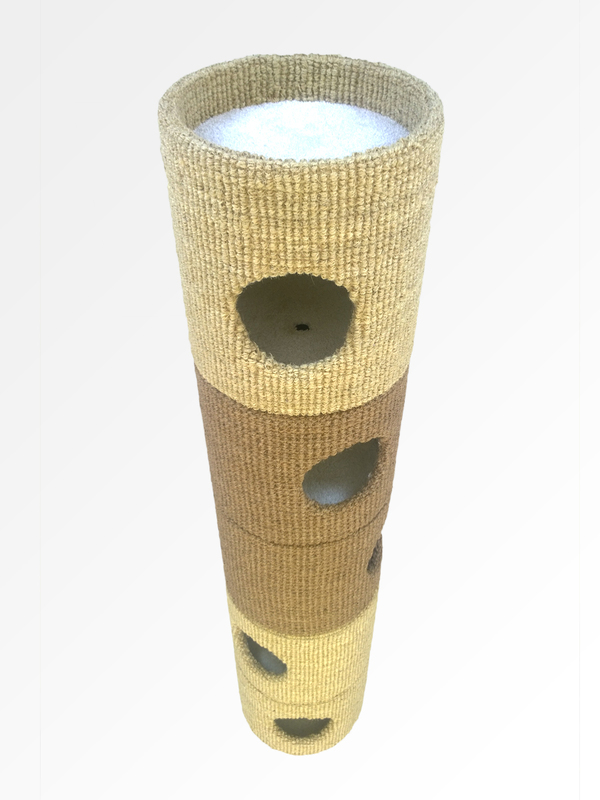 Catapilla™ is the modular version of our Fatcat cat climber with a twist - it's made up of compartments that can be stacked up to four units high & rotated independently of each other in 360°. Catapilla™ is made up of connecting Body compartments & Body+ compartments that have integrated recessed platform - each compartment has an access hole & it's own private enclosure for sleeping & lounging. Compartments are finished externally in either Bleached or Natural Coir with a Black Twist pile internal finish - compartments are also available in our bespoke Slate Coir finish. The Body compartments are 400mm tall & there's a 470mm high Recessed Top compartment to finish off the unit - compartments can be stacked up to four units high when mounted on the 720mm diameter black painted Base or used as single freestanding units without a Base. Body compartments have top & bottom connections so they can be assembled in any order, either way up & rotated to face in any direction - the Body+ has a centred bottom connection for fixing in to a Body compartment below when stacked. Catapilla™ is available in bespoke internal & external finishes - units have been fabricated with multi-coloured & white internals & other external bespoke finishes including wool & sisal. A lid is available to finish off the top of a Body compartment when used as a single stand alone unit or when configured without a Body+ compartment on top - there's also a Wall Mounting Kit that allows you to stack units without the need for a Base. If you want to give your cat an even more luxurious bedding arrangement then add a Fat Pad cushion inside a compartment or into the platform on top of a Body+ unit. There also a set of Feet available to attach to a Body unit when used as a single floor standing unit. Units come complete with fixings & tools to assemble units - please see our Installation page for more information. You can purchase your Catapilla™ from our online shop & orders are normally fulfilled with 15 working days - shipping is calculated at checkout & please get in touch if your country isn’t listed & we can provide a Delivery Quote. Our products are made by hand in our London studio so we can produce bespoke & special orders - please get in touch if you would like to create something extra special.